What happens when money starts sprouting on trees? About what you’d expect: a lot of people didn’t notice, the ones who did seemed to assume it was an art installation and snapped pictures with their camera phones, and then once one brave dude started to harvest a few of the notes for himself with no ill-effects, everyone else joined in. The money tree was a marketing ploy by RaboDirect Australia, and it reminds me of the old joke about the economist who doesn’t stop to pick up a $20 bill he spots on the ground, because he assumes if there truly were a $20 bill free for the taking, someone else would’ve nabbed it by now. 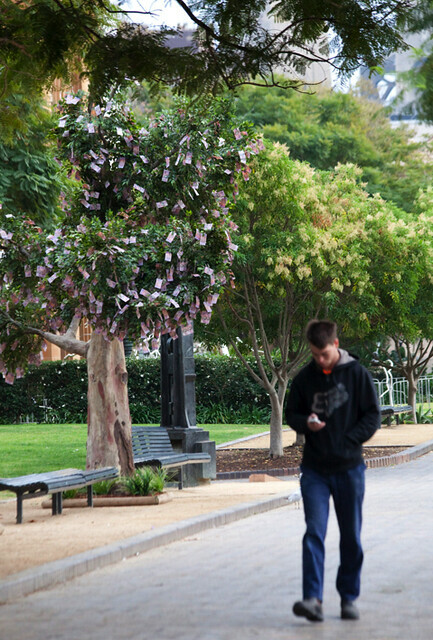 To be fair, I think I’d have the same reaction as those who stopped and took pictures — it seems fair to assume that if you see a money tree pop up in a park, some hipster art student is behind it. I don’t understand the people who didn’t even notice it, though; I can see how green backs might be missed, but Australian money is bright and gaudy enough to stand out.